With this picture I'm starting my new "Daily Photo" blog. 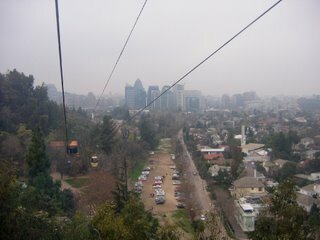 My goal is to show you my beautiful city, Santiago de Chile, and its daily life. This picture was taken from inside a cabin of the San Cristobal Hill Skyride. I hope you like my city and I expect to see you around very often! Welcome to the family Eduardo. I have never been to Chile but I have been told it's really a place that is worth visiting. me necesitan a mi tambien!! quiero postear y estar acá!! Hi, it's a very nice view from the Hill...i've been in Santiago several times and it's really a great city..do you have any pictures of the Andes?? it would be great and i think people who have never been there will find them amazing! Yes, I'll post a picture of the Andes soon.